Letters come in a variety of forms and are used for different purposes. Even when everything is so advanced, letters or the old school ways as we call it, are still being used to relay important information from one person to another. Most letters nowadays are used for business and other legal purposes mainly because they provide both parties with a solid and tangible proof that can serve as evidence in court when the need arises. 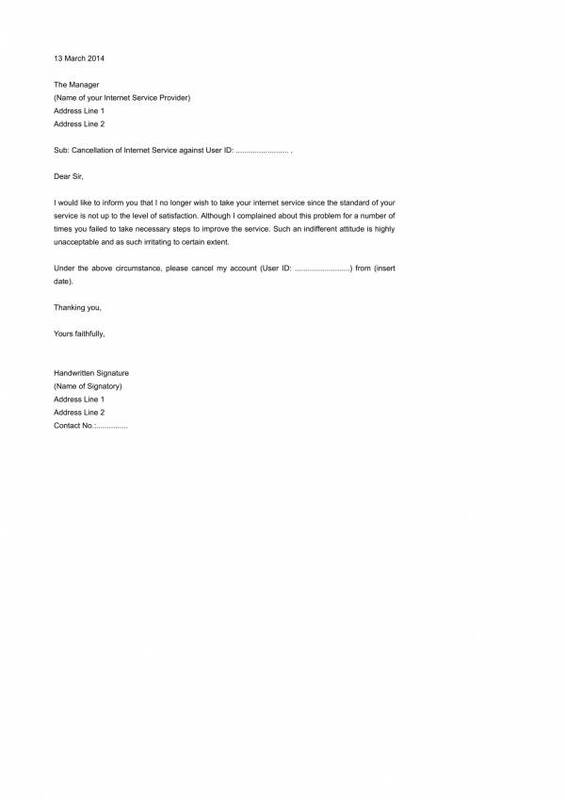 Contract termination letters are one of the many types of letters that are still being used today and are given as much importance as any legal document. What really is this letter and on what things is is used for? 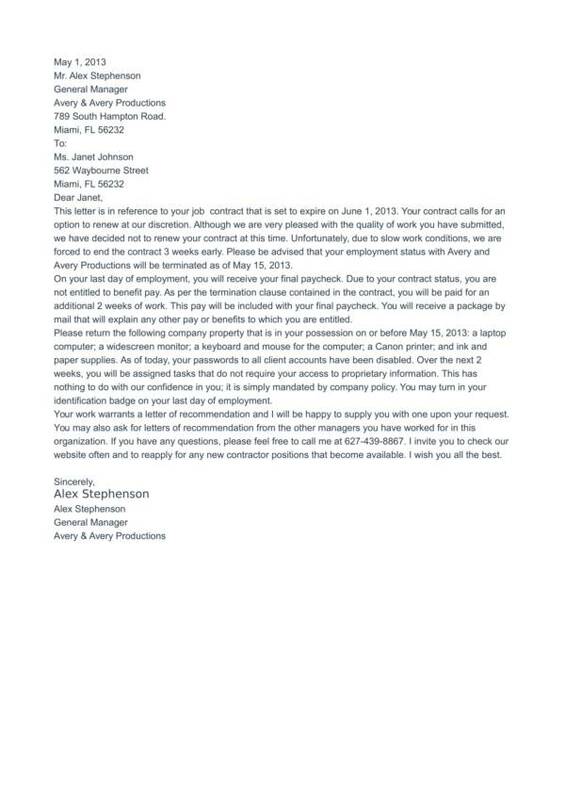 This and other related information about contract termination letters is what we will be covering in this article. 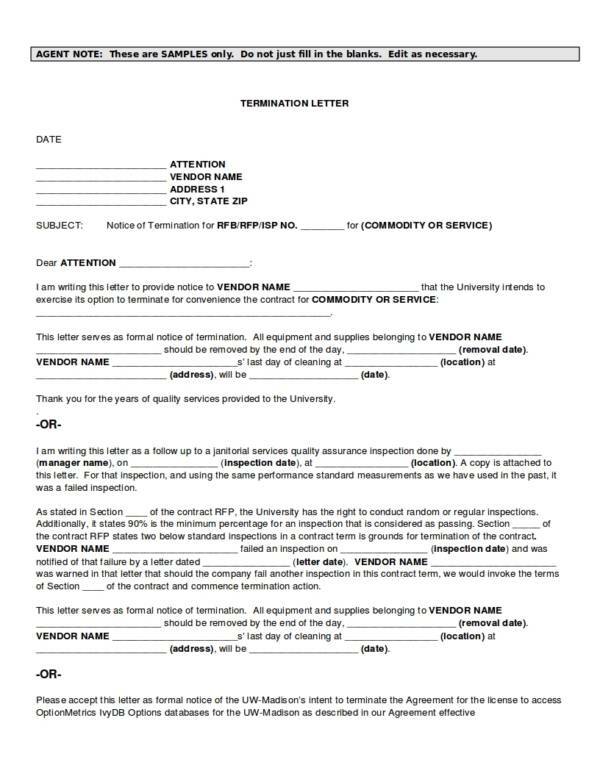 Also, for your reference, we have included termination letter samples and templates that you may view or download. A contract is defined as an agreement between two or more parties that is pertaining to a particular thing. Once a contract is signed, all of the parties involved in it are bound to the terms and conditions that are stated in the contract document. In certain cases, what has been bound are meant to be unbound due to clear and known reason. 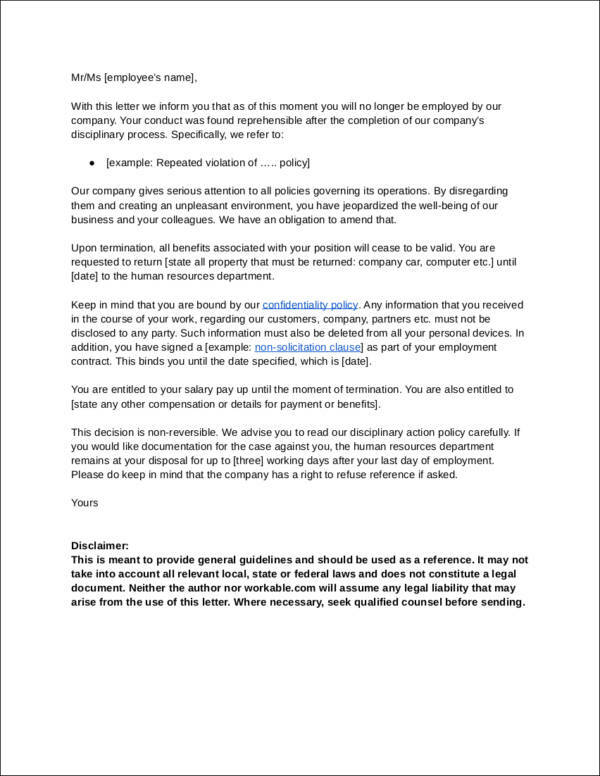 Situations like this also take place in real life and to notify the parties involved in the said contract, a contract termination letter is written and sent. 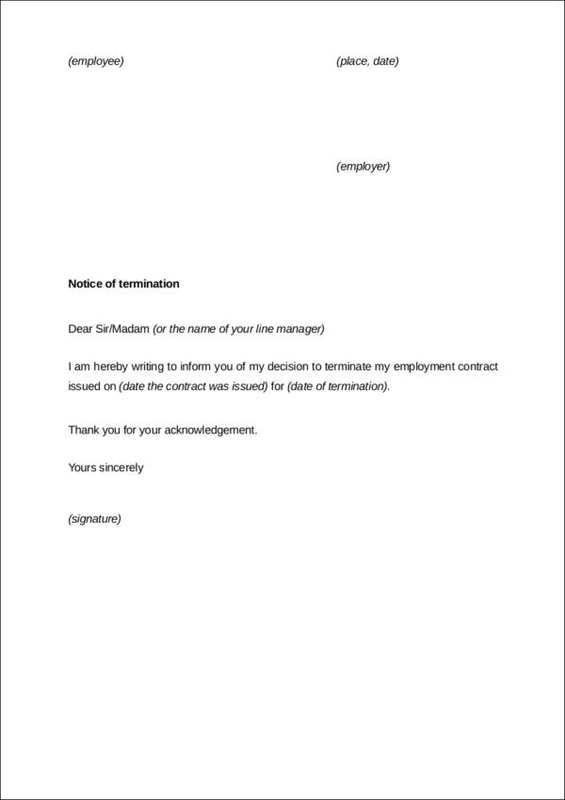 A contract termination letter is a letter that is specifically used to notify the parties involved in the contract that it is going to be terminated with the details for termination. It is a formal way of declaring or telling other parties of your plan or decision to terminate your contract with them while still maintaining the current status of your relationship. The information that must be included is the effective date of termination, the termination clause being referred to, the names of the parties involved, the reason or situation that triggered the termination and if there are any remedies to it. 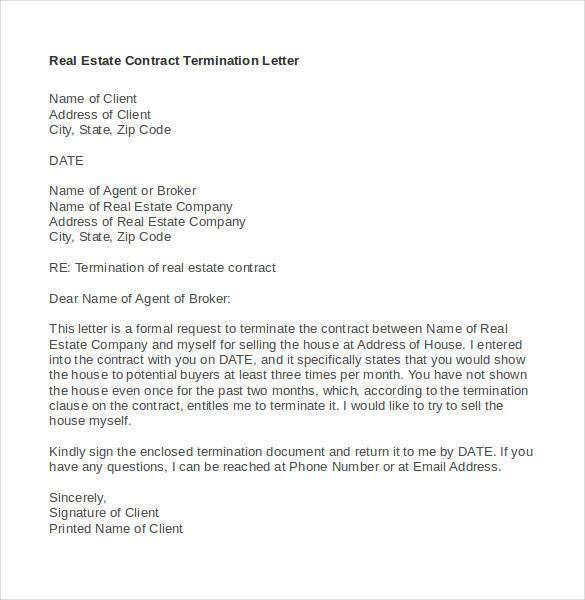 Contract termination letters are formal letter or business letters so writing them requires that you follow the formal writing protocol, which is using a formal letter format. And regardless of your emotions or feelings at that time, your letter should never be rude or condescending. It must always be polite and professional. 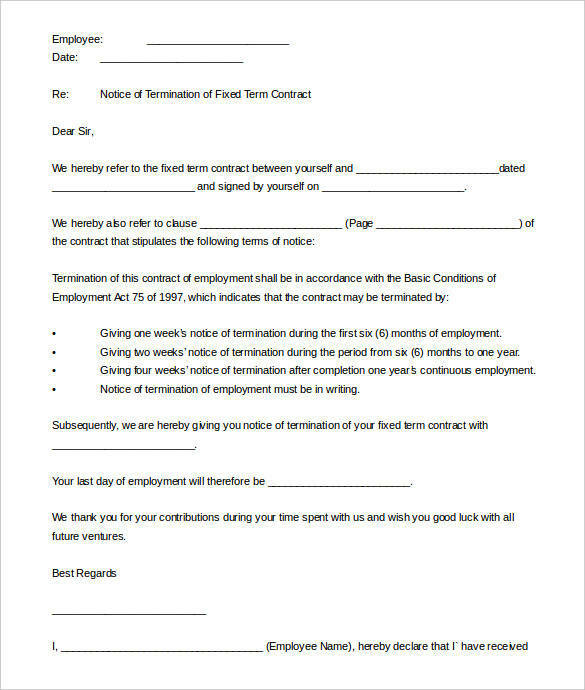 A contract termination letter can be considered as a legal document that can be presented in court as proof that you have followed the proper procedures in terminating a contract. 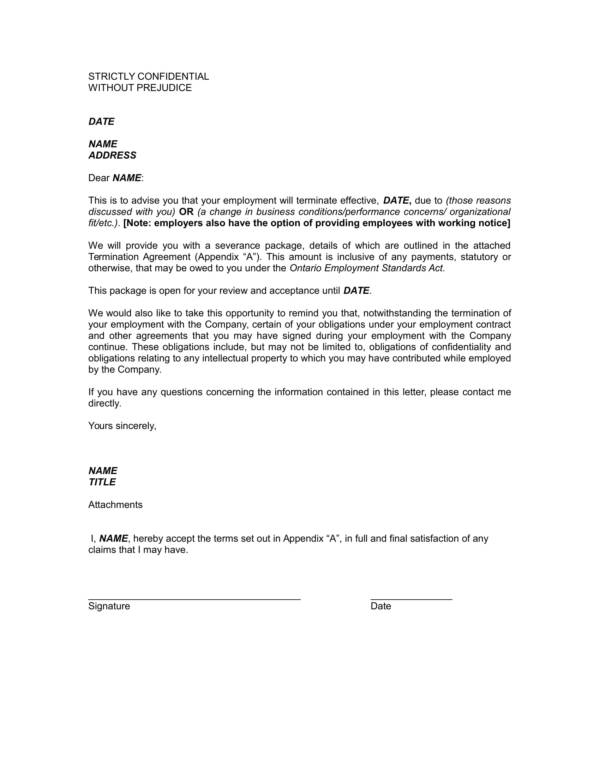 It is used to provide a notification for terminating an existing contract. It records the details of everything or all of the justified reasons why one came up with the decision to terminate the contract. Everything that one has written is recorded there, which will come handy if other parties claim something else along the road. When writing a contract termination letter, the terminating clause and other provisions of the contract allowing for its termination should be included and stated in the letter. This is done so that all who are involved will know and also for the sake of formality. Not everything in a contract termination letter is bad. In fact, it is often used by some as courtesy to thank other parties involved of their services. This way your good relationship with them will be preserved. It is used for documentation purposes that will record the events or instances while the termination is being processed. 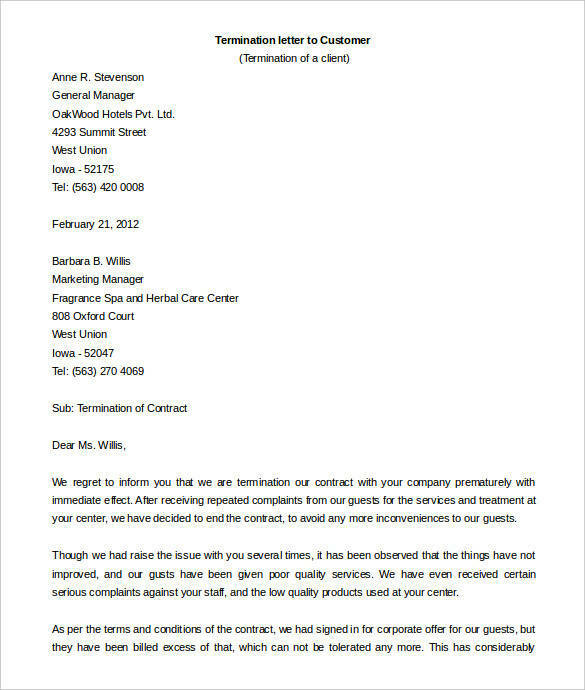 Other articles related to termination letters and letters in general can be found on our website. 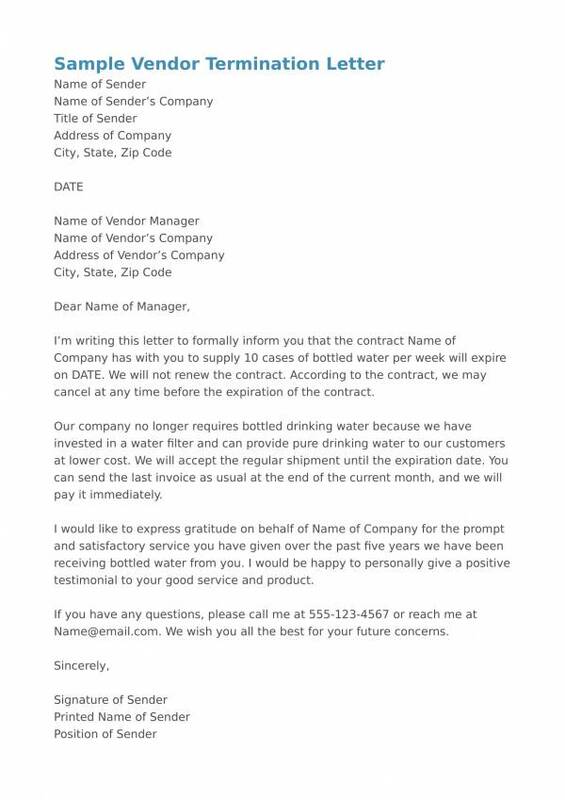 A few examples are Agreement Termination Letter Samples and Templates, Company Termination Letter Samples, and Formal Termination Letter Samples and Templates. What Are the Types of Termination? There are two main types of termination and they are voluntary and involuntary termination. Let us go more into detail about these two types. When you say involuntary termination, it means that you personally initiated the termination of something. It could be the termination of a contract or the termination of one’s employment. 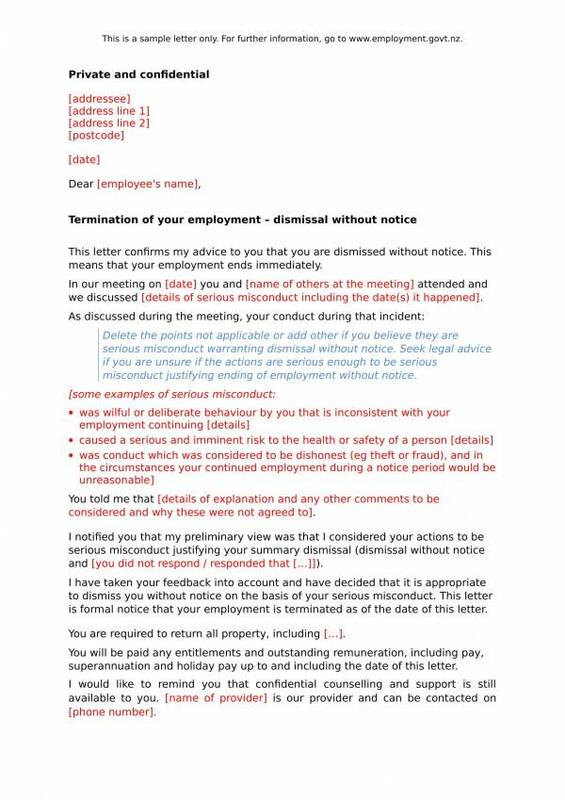 As an employee, if you voluntarily terminate your employment then that means you resigned from your job on your own accord. Even if it is said to be a voluntary termination, there is always an underlying cause for it and most of the time it is due to personal reasons. Contrary to voluntary termination is an involuntary termination. This means that you are not the who decided to end a contract or employment but you are forced to end that contract or your employment. Ending a contract or an employment is not as easy as what we think it is. This is because you cannot just terminate a contract or an employment just because you want. Due process needs to be followed in order to have this done and solid evidences should also be presented to support the case. If an individual fails to follow due process before notifying for termination, then they may face certain consequences for their actions. These consequences, however, are not those that you can take lightly. They are legal matters and you surely would not want to get involved in any of that. 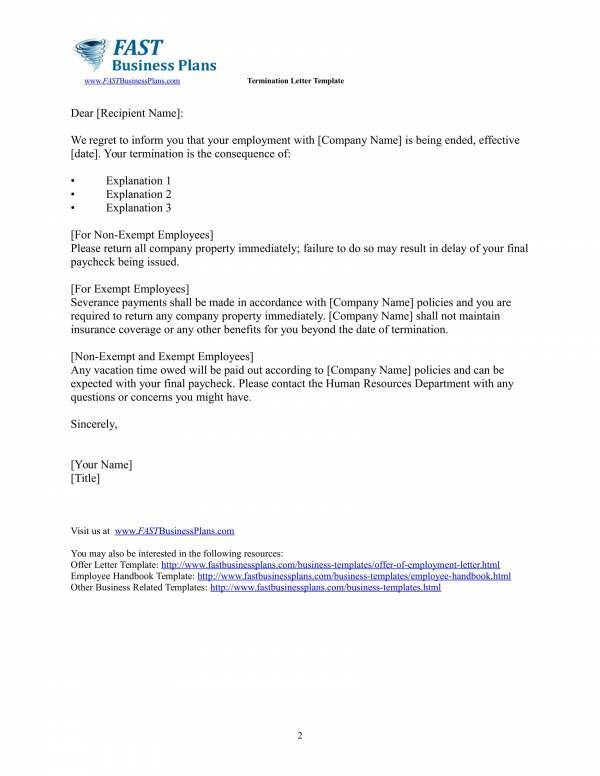 You may also check out other related titles, like Letter of Termination Samples, Tenancy Termination Letter Samples & Templates, and Employment Termination Letter Samples & Templates. You might find it a scary thought to back out of a contract after you have ultimately agreed to it and signed the document. Why do you want to back out in the first place? There could be good and just reasons for that and there also time when you realize it’s not something you want, which leads you to change your mind. A contract is not something that you can easily back out from just because you have changed your mind or some factors convinced you to change your decision. While there are contracts that would allow you to cancel within 3 days, there are still others that wouldn’t. In other words, once you have signed that contract, there is actually no other way for you to back out. 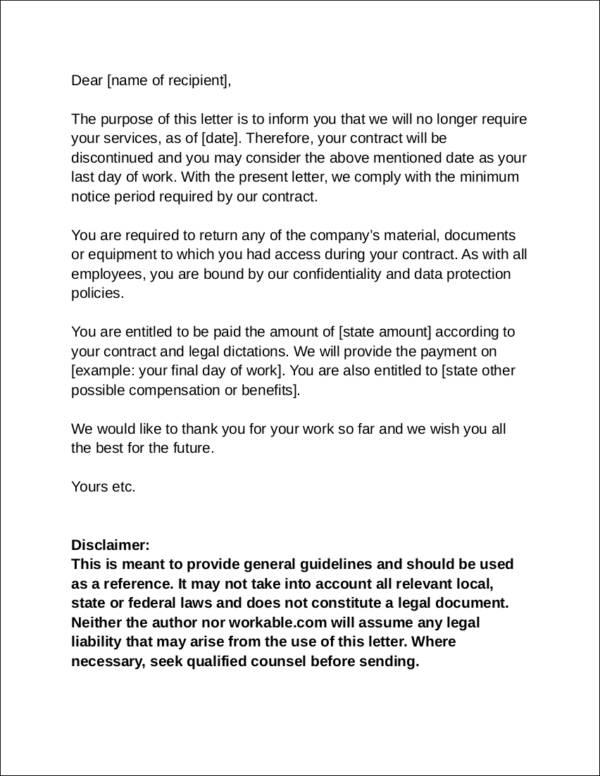 But there are possible and legal reasons for having it terminated, such as fraud or being tricked into signing the contract, a termination clause in the contract, if the contract becomes impossible to fulfill, if you have a prior agreement, if the contract has been misrepresented, or better yet when the contract comes to an end. You may r may not be allowed to back out from a contract depending on the transaction you have or as specifically stated on the terms and conditions. What Are the Reasons for Terminating a Contract? There is no turning back when a contract is signed. That is the ideal thing to think of when it comes to contracts as all of the members of the contract are obliged to follow the terms and conditions stated in it. A contract is created in a way that should never be terminated before its actual end. But no matter how you put it, there will always be reasons for terminating it, good or bad, just or not. Here are 5 reason for terminating a contract that you should know of. A breach of contract is defined as a violation of the contract and its terms and conditions by any of the parties involved in it. A breach also takes place if any of the parties involved refuses to do their share of responsibilities in the contract, if they did something that they are not allowed to do or did not allow you to do what you are supposed to do. A number of things and actions can cause a breach of contract as long as they part of the agreed upon terms and conditions. Contract breaches are perhaps the most common reason why a contract is terminated. Once a contract is breached, the breaching party will face consequences and may even have to go to court. Having to pay for heavy fines is also possible together with other remedies. When is it impossible to fulfill a contract? The actions taken to complete a contract is called a performance. The parties involved in the contract are required to perform in order to have the contract completed as desired. But when one party becomes incapable of doing so because of reasons that they cannot defy or makes it impossible for them to perform, then this is when they can terminate a contract without fear of getting into legal problems. 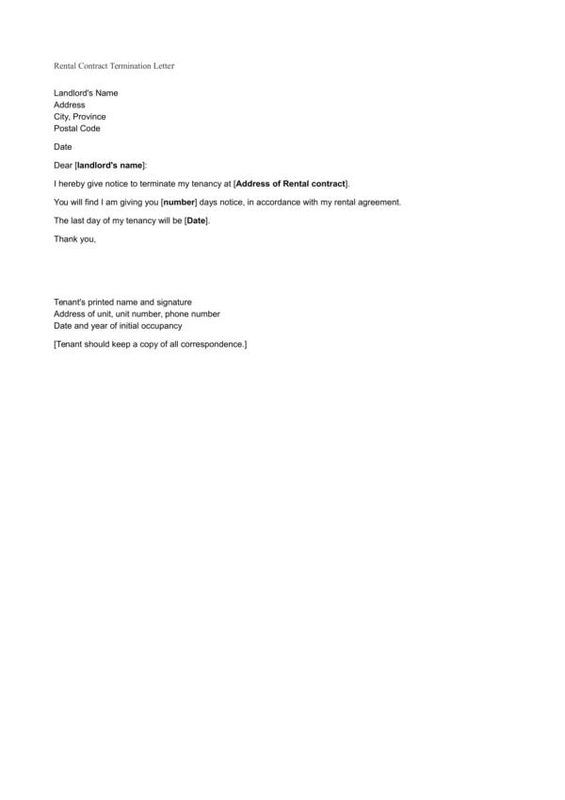 Let us site an example to further help us understand when a contract is impossible to fulfill. Let’s say your band signed a contract to perform on stage during a certain event. But all of a sudden three weeks before the performance, a typhoon was reported and the whole venue is flooded and ruins. It has been declared unsafe to to use and all the other surrounding areas are also not in good shape. This is a situation where there is no way for you to perform on stage so the contract deemed impossible to fulfill. Every contract has a due date and on that specified due date, the contract will come to an end. This means that the contract will automatically be terminated on the said date and all the parties bound to it are officially and legally freed. There is one good reason for terminating a contract as there is little to no conflict between the parties involved. The contract ended as agreed and everything should be good. 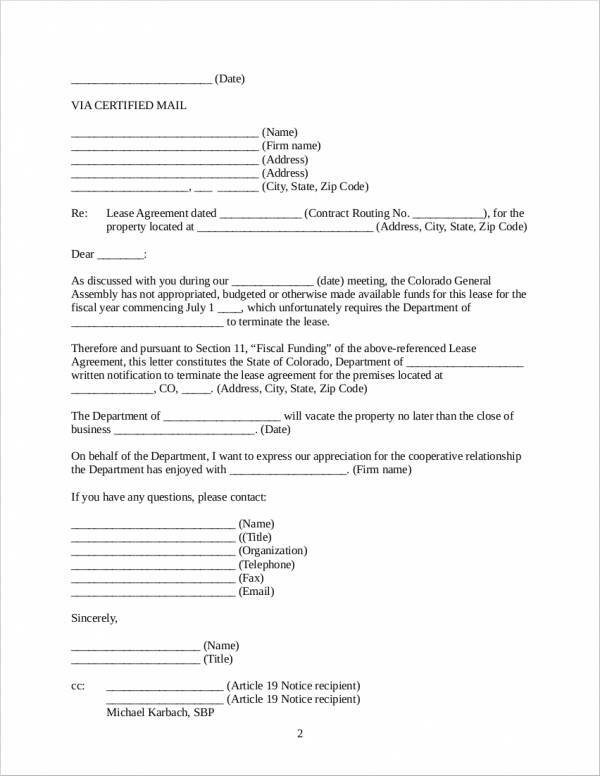 Prior agreements are those things that both parties have agreed on prior to the signing of the contract. It may be one of the clauses included in the contract, such as a termination clause. If certain conditions in a contract are met, then it can very well be terminated as agreed upon by both parties. 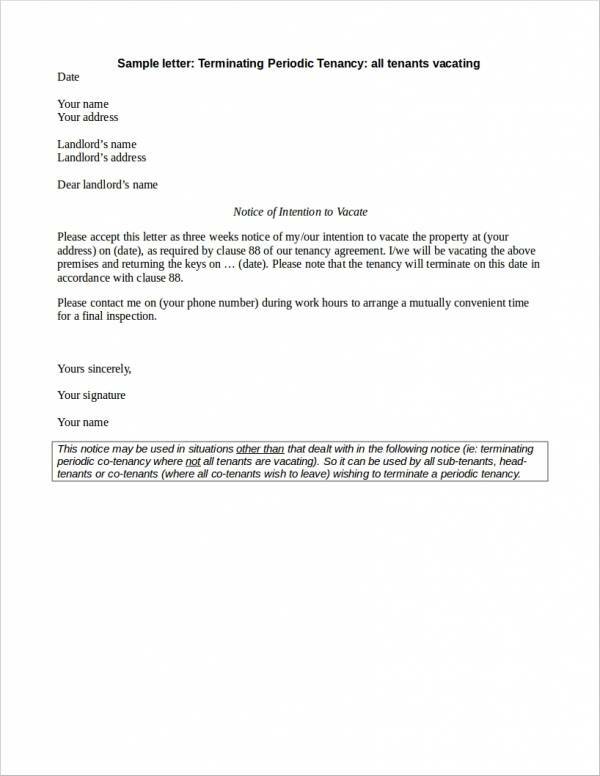 A written notice is sent to the other party to notify them that the contract is to be terminated. Even with a breach in contract or prior agreements, it is just not that easy to terminate a contract. Due processes needs to followed to prove that the said reasons for termination are valid and reliable. 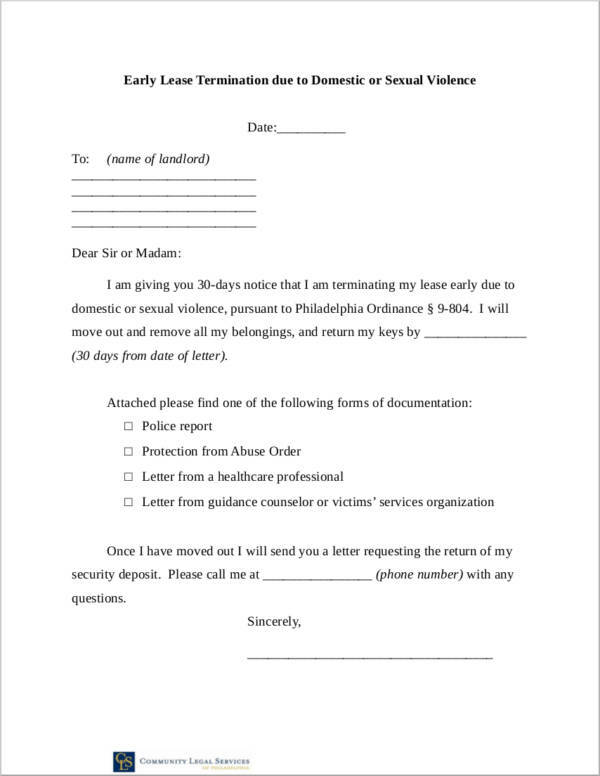 You can find a variety of related samples and templates on articles, like Lease Termination Letter Samples and Templates, Notice of Termination Letter Samples & Templates, and Job Termination Letter Samples & Templates. What Is the Difference Between Cancellation and Termination of a Contract? Cancellation and termination both mean ending something, but when it comes to legal contracts, they are actually referred to as two different things. They are both used to indicate the end of a contract, but the way or situation in which the contract ends the main indication of their difference. Termination of a contract usually takes place before the actual contract term ends. This could be because of a prior agreement or because of a mutual understanding between the two involved parties. 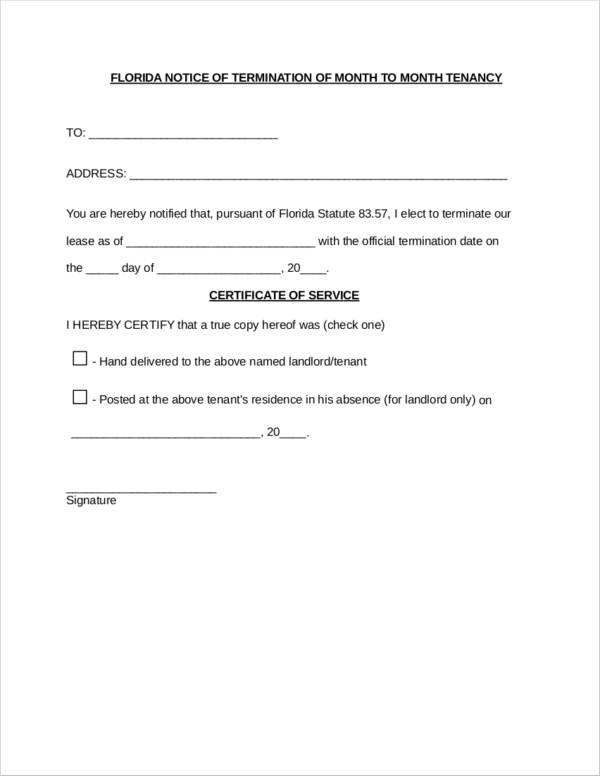 In this case, a contract termination letter is submitted or sent showing proof that both of the parties involved in this contract have agreed to terminate it or they have accepted the termination. Termination of a contract is also defined as putting an end to the contract without any party breaching it or without violating any of its terms and conditions. it is also a legal and accepted way of ending a contract. On the other hand, cancellation of a contract means that it is forcefully put to an end by destroying its validity, effectiveness, and by discharging the guilty party from all of the obligation that they have under such contracts. In simpler terms, cancellation of a contract takes place when any of the parties involved in it has breached the contract or has violated the stipulated terms and conditions. Unlike a termination of a contract, cancellation of a contract is not legal and the remedies done to fix the problem at hand may involve going to court and paying hefty fines. 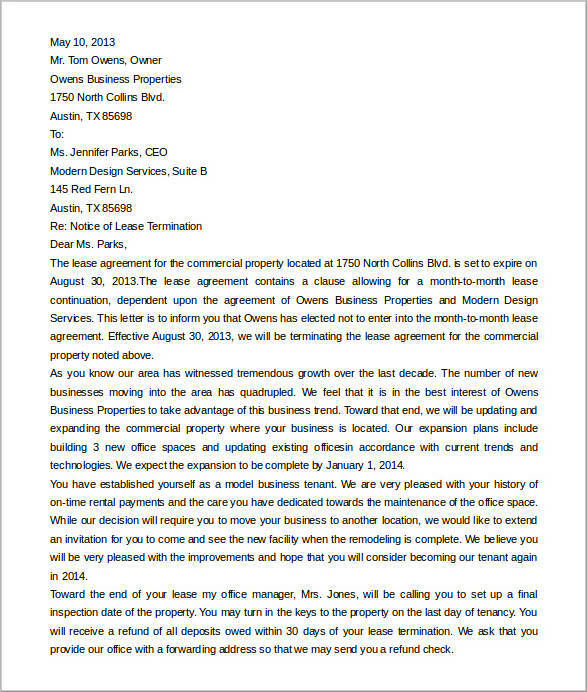 You may also be interested in checking out articles that are closely related to this topic, like Rental Termination Letter Samples and Templates, Basic Termination Letter Samples & Templates, and What to Include in a Commercial Lease Termination Letter. What Is a Termination Clause in the Contract? It is common for any contract to have their own set of contract clauses. Contract clauses make up parts of the terms and conditions of a legal contract that addresses specific aspects or issues that are overall related to the subject matter of the contract at hand. These contract clauses provide not only specific provisions of the contract, but it clearly defines the rights, duties and privileges of the parties involved in the contract. A termination clause is one of the common clauses that is present in a contract. What does this termination clause do? It is the clause that allows for the contract to be terminated and discontinue their obligations based on the specific provisions or circumstances that has been agreed upon by the parties involved in the contract. However it does not only end to the termination of the contract, but the details of the clause continues with the remedies for the termination. It is important to clearly understand and pay attention to the clauses in a contract as they are very critical to what will happen to after you have signed the contract document. A slight misinterpretation could mean legal liabilities and there is just no excuse for that. 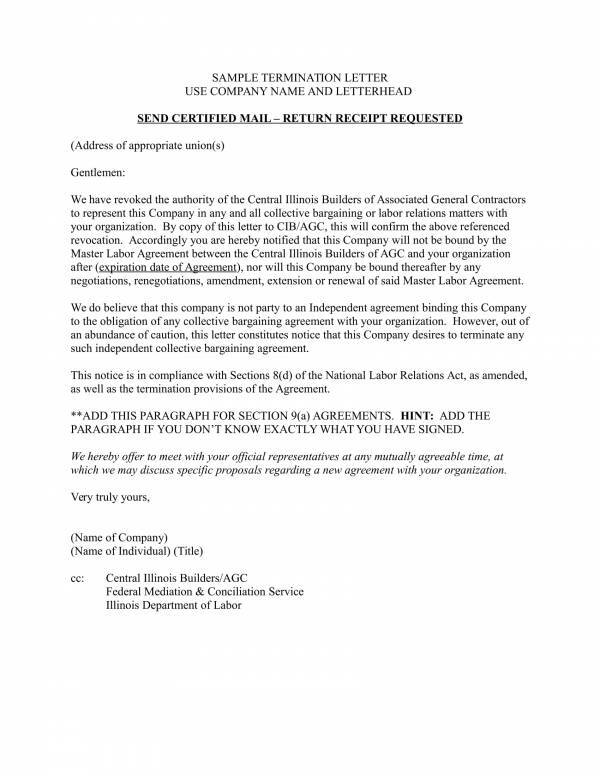 For more about contracts and contract termination letters, you may visit our website and check out the related articles we offer. 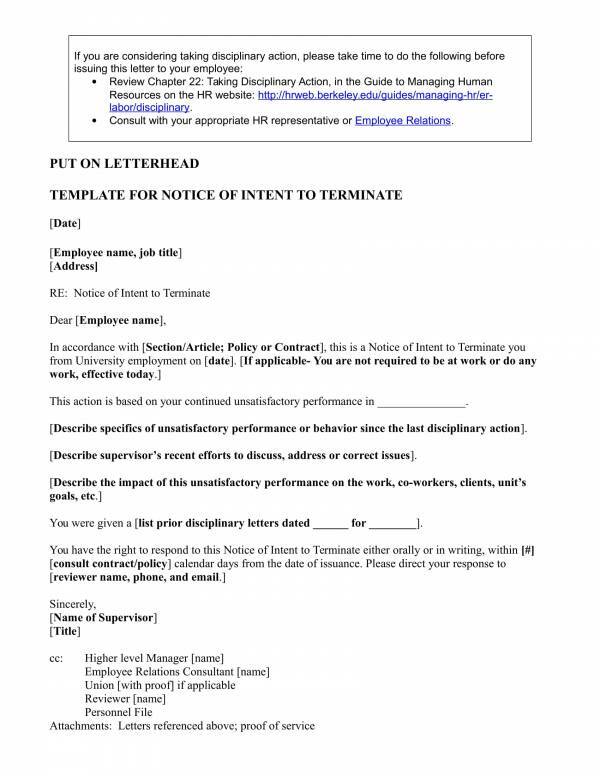 To name a few are Free Termination Letter Samples & Templates and Uses of Termination Letters in the Workplace. 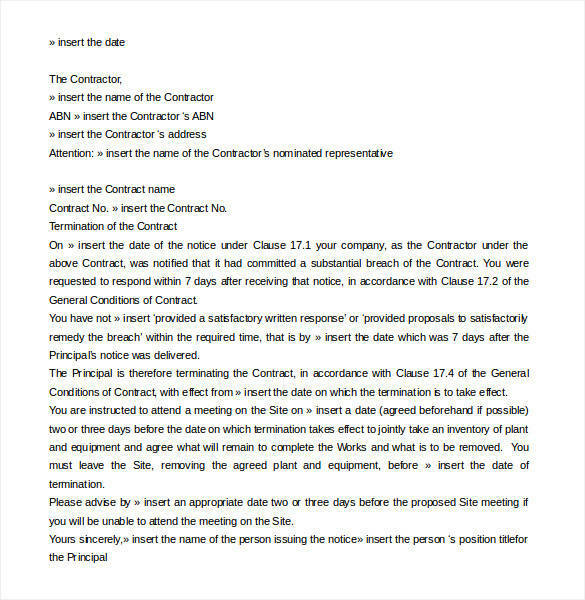 A contract termination should be written using a formal letter format as it is type of formal letter. Care should be taken when writing this type of letter because aside from being a formal letter, it may also be used as evidence in court when the situation requires for it. 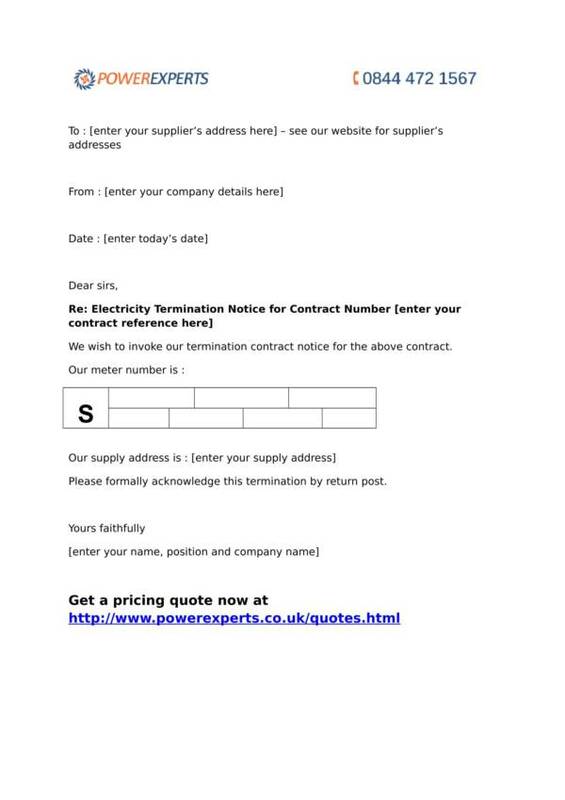 To help you write a contract termination letter, here are simple guide that we have created just for you. Knowledge about letter writing is ans essential skill when it comes to writing letters, regardless of what type it is. The basics and fundamentals of writing will help you with the formatting down to the what contents to write on your letter. 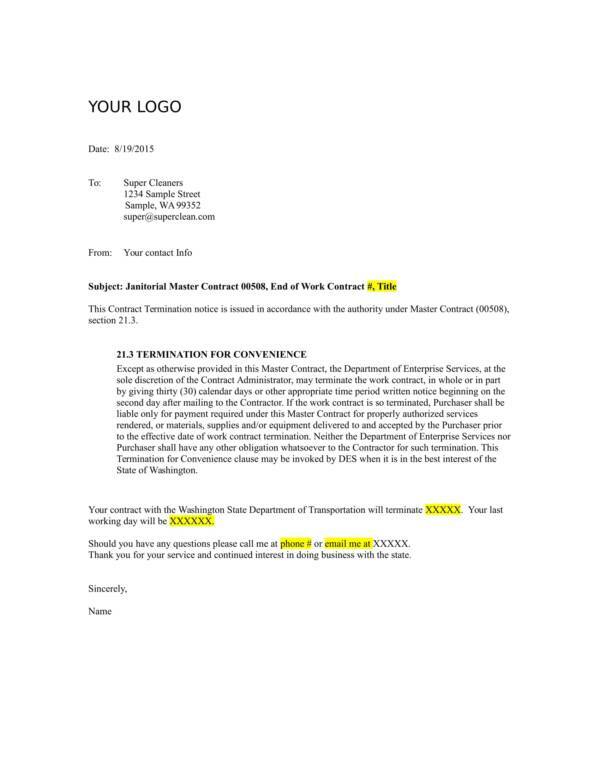 Find samples and templates that you find easy to understand as your reference when writing a contract termination letter. A lot of these samples and templates are offered online for free. Study the main reason or cause why the contract needs to be terminated. Your study will make up the largest part of your letter which is the body. Check the termination clause, if the contract was misrepresented, or if the contract became impossible to perform. 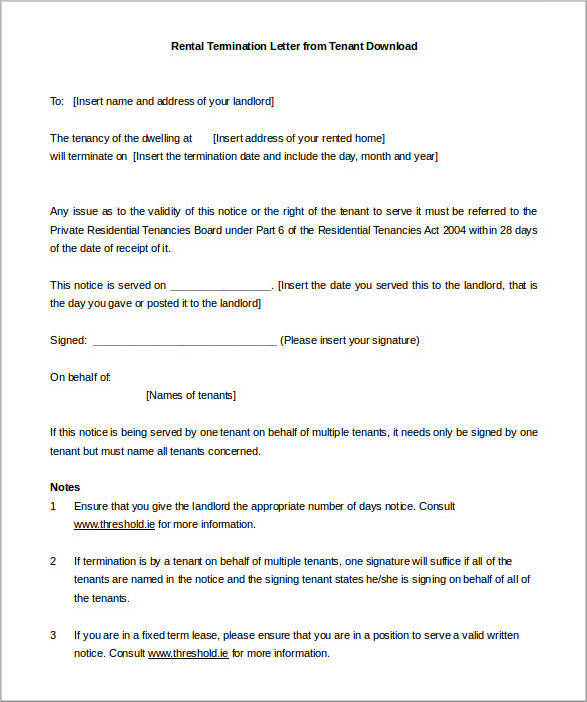 Gather all other necessary information for your letter, like who are involved in the contract. Now, make a draft or an outline of your letter. This is where you position the details that you have already gathered. Next, start writing the contents of the body of your letter. It should be made up of several paragraphs each containing or discussing different topics related to the termination of the contract. Once you are done with the contents of your letter, assemble them on your working sheet. After that, your work would be almost near to its completion. But before that you will need to have your manger or someone more experienced double check it. Then you will need to check for spelling and grammar errors. Mistakes can easily be avoided if you include this step to any of your work. 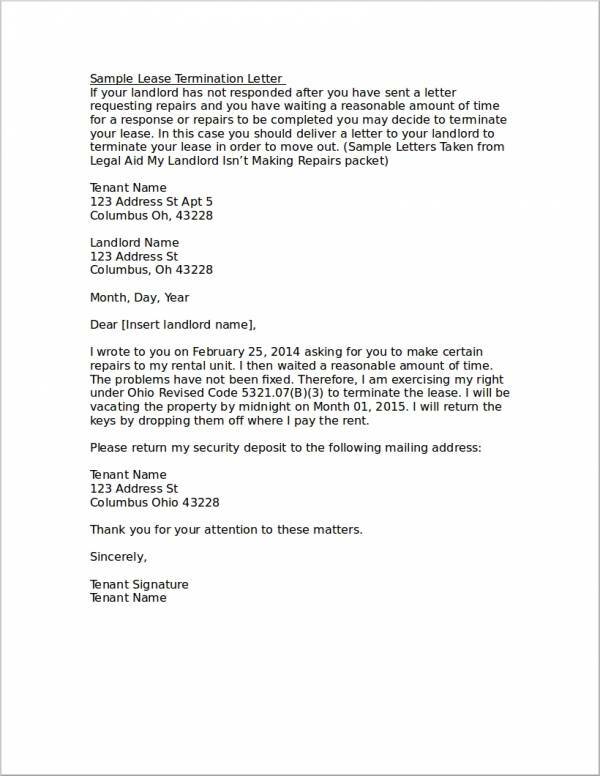 When you are satisfied with what you have done and everything on your letter is in place, save your work and print the number of copies that you need to send out. 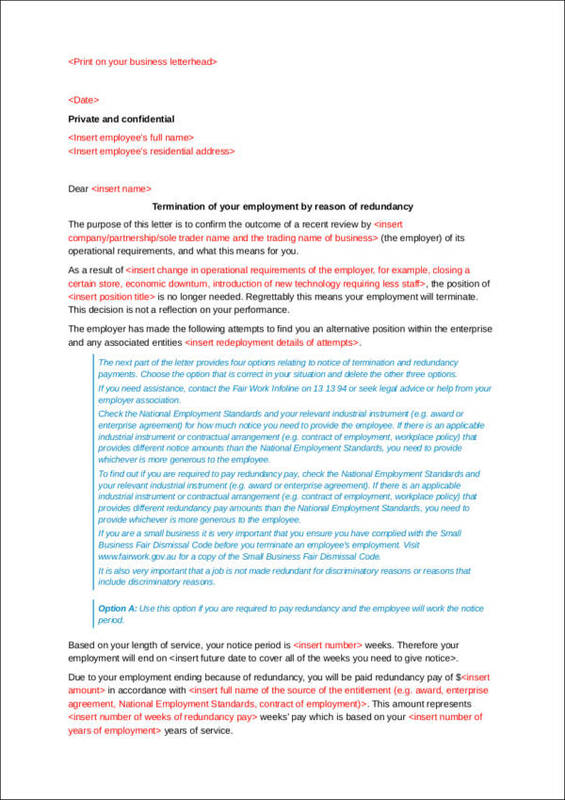 Use this guide to help you with get started with your contract termination letter. Later on, you will be able to develop your own style and your own guide in making one. 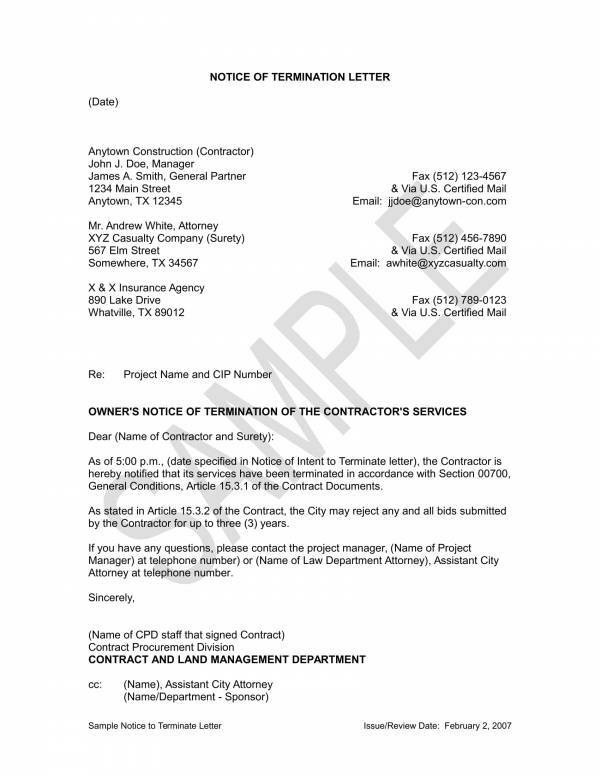 If you also need samples and templates for your reference, you can check out articles, like Printable Termination Letter Samples & Templates and Guidelines for Termination Letter. 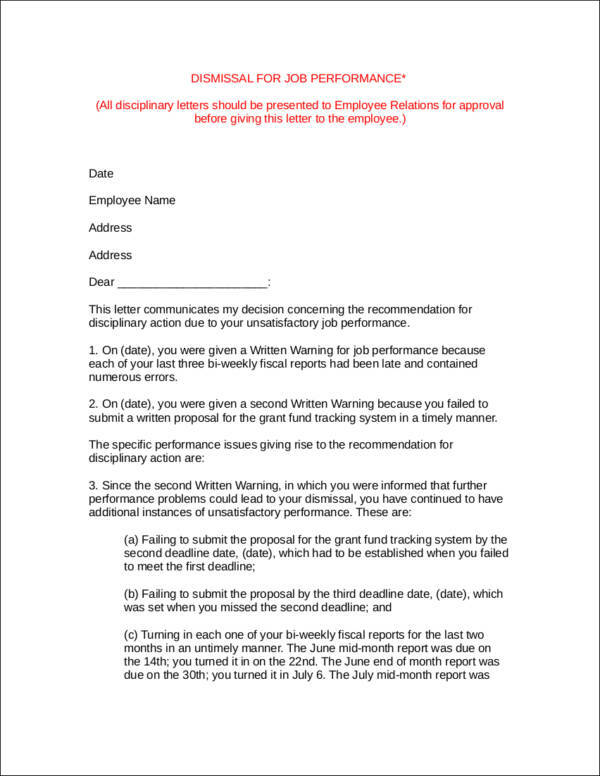 We have here a list of things that you can possibly do to make your termination letter better. Make sure that you study the matter at hand before proceeding with writing your letter. Take down notes and find rebuttals to all of the details you will include to prevent loopholes in your reasoning. Remember to never stray away from the subject matter. Loopholes arise when you talk about something unrelated or when you talk about something that has definitely nothing to do with the subject of the letter. Write clearly and concisely. Using words that could mean a lot of things is also not a good idea. You must be precise and careful with the words you will be using as they may be given a different interpretation, and used against you. Provide references. If you mention or explain something based on the law, provide your references or the actual law that you used as reference. Follow standard formatting. A formal letter should only be written using a formal letter protocols and nothing else. To you it may seem like some minor detail, but it actually shows how professional and serious you are when it comes to the matter at hand. Always make it a habit to proofread your work. Mistakes will make your work look unreliable and unprofessional. Don’t be laughing matter and start proofreading your work on any opportunity you have. Be mindful of the clauses in the contract. 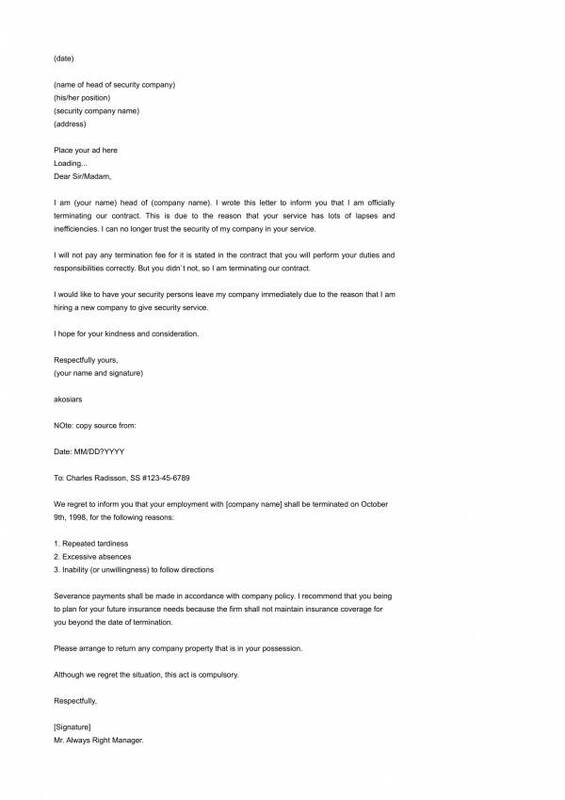 Be careful not to mention other clauses that are not related to your letter as you may just be opening a can of worms that might put you in a very difficult situation. Using these tips will help you improve your writing skills in general, thus allows you to produce better, more reliable and effective contract termination letters. You may also be interested in other related titles, like How to Terminate Contracts in the Workplace and Writing Termination Letters Due to Poor Performance.